Siri becomes an essence of our interaction with Apple devices. It moved from phones to Macs and now we’re getting used to sci-fi talk with our computers. Finally, Jarvis is here to make us all feel Tony Starks on a daily basis. But when we get a little too intimate with our digital assistant and it feels like it’s better to get rid of those last questions we asked, can we do it? Let’s take a look at the whole process of asking Siri. Be it your Mac or your iPhone, if you have the same Apple ID on all devices (and you’re logged in) — your Siri shares the same history, even though it has access to different files. When you ask Siri a question, to answer it or fetch the requested files, it can go rummaging through all your files, Mail, calendar events, notes, even inside the documents. Obviously, it also goes googling. After that, both your question and the results are stored, as Apple says “for a period of time” on their servers. There’s a reason why Siri doesn’t work without internet connection. It’s because it’s not an assistant on your Mac, it’s an assistant that dwells on Apple servers, operates through them, and reports to them, and keeps all the information you asked on them. Now, Apple argues that information is disassociated from your ID and is stored as raw data for analysis and improvement. How it’s being disassociated and how soon, can it be associated back if needed, can it be viewed by third parties in the court case or in the event of emergency — none of that is clear and none of that is really explained by Apple officials. We know two things for sure: customers don’t have access to Siri history to view it and yet this history is stored in some form at Apple. As you might have guessed from the previous part of the article, since Siri history is not stored on your Mac, nor it is in any way accessible to users, there is really no way to clear it. Good news is, if guys at Apple keep their promises and disassociate requests from your ID, no one can see your Siri search history, so there’s no actual need to delete it. If news about Siri sending your info to Apple has your worried, there are some tips to lay low and avoid the digital spotlight. 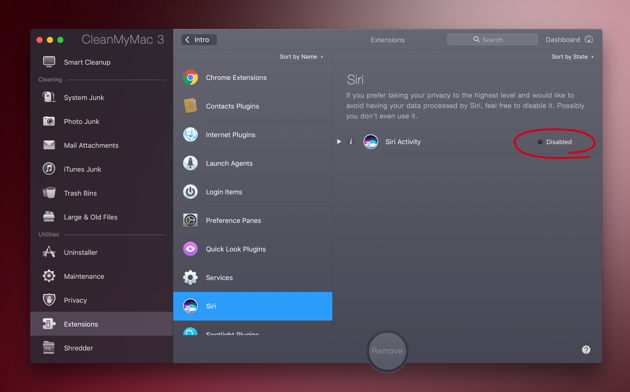 First and most obvious, you can disable Siri in CleanMyMac 3. It’s not that hard, both on Mac and iPhone/iPad. Disabling Siri means that it stops listening to your voice commands, stops responding to shortcuts, and stops communicating with Apple servers and sending information. Then, you can hide the files you don’t want Siri to see. 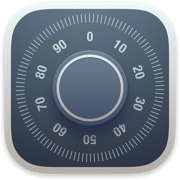 There are applications like Hider 2 that allow you to encrypt and securely hide files and folders in a digital vault. Siri won’t have access to it, even if you ask her. You won’t have to worry that when someone uses your Mac and Siri (which theoretically they cannot do because it’s wired to your voice), they will accidentally stumble upon something valuable or private. Finally, it’s really challenging to remain hidden from the Big Brother in the XXI century, so if you’re serious about keeping your privacy, don’t do private stuff on devices. Frankly, a private notebook is only private when it’s handwritten and sits in a drawer in the attic. Unless you hide and encrypt every file you don’t want out in the open, there’s no confidence it won’t end up there. To sum it up, don’t ask Siri criminal stuff because even though you search history cannot be viewed by anyone, it’s not on your Mac so you can’t delete it. To hide files you don’t want Siri to find download Hider 2 and use its encrypted vault. And in case you really don’t want Siri communicating with Apple, you can always turn it off for good. Need to protect private data on Mac?